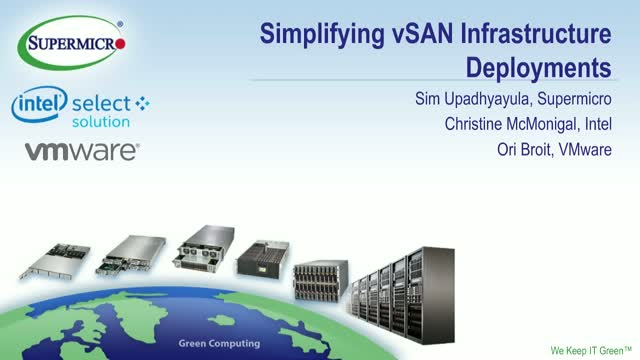 Supermicro and Intel are pleased to introduce two new Intel® Select Solutions for VMware vSAN from Supermicro. These vSAN ReadyNode certified configurations comprise the latest generation of Intel® Xeon® Scalable Processor and Intel® Optane™ technologies, addressing the IOP and latency requirements of the most demanding enterprise applications. These hardware platforms have been optimized to support the latest hyperconverged technology from VMware, providing excellent performance and TCO to enterprise and SMB customers alike. Join us to learn how your organization can benefit from these innovative new solutions.